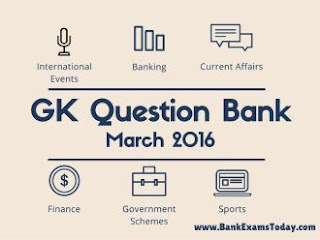 In a series of sharing useful study material for competitive exams, today I am sharing Current Affairs question bank for the month of March 2016. 1) Who has received the World Peace and Prosperity Foundation Award for the year 2016? 2) On which date, the Indian Army Day is celebrated? 3) Who has been bestowed with the Mohammedan Sporting Club life-time membership? 4) Which of the following organisations has won the National Award on e-Governance 2015-16 for launching the Universal Account Number (UAN)? 5) The Nagjee International Club Football Tournament will be held in which state? 6) Jacob-Farj-Rafael, who passed away recently, was associated with which of the following events? 7) What is the name of the new crop insurance scheme approved by the union cabinet? 8) Which of the following cities is the host for the 66th Senior National Basketball Championship for Men and Women? 9) Which of the following panels has been set up to study 7th Pay Commission’s recommendations? 10) Which of the following countries rated number one in A T Kearney’s 2016 Global Services Location Index (GSLI)? 11) Who has honoured with the Danny Kaye Humanitarian Leadership award? 12) Which state has become the India’s first fully organic state? 13) Alan Rickman, who passed away recently, was related to which field? 14) Who has been conferred with the 2015 Sree Chithira Tirunal national award? 15) Which state has been conferred with the 2014-15 Krishi Karman award? 16) Which Indian state is set to fly the world’s largest tricolour on republic day? 17) Who has been honoured with Neerja Bhanot Bravery award? 18) Who is the author of the book titled ‘Creating Leadership’? 19) How much cropped area in India is presently covered under crop insurance scheme? 20) Which of the following organisations has published the 2016 World Development Report? 21) Which bank has launched India’s first start-up focussed bank branch? 22) Who has become the first Russian to be inducted into International Tennis Hall of Fame? 23) Who have won the 2016 WTA Apia International title in the women’s doubles category? 24) The 2016 Sahayog-Kaijin military exercise has been conducted between India and which country? 25) Who has won the 2016 Pritzker Architecture Prize? 26) Who has won the 2015 Lorenzo Natali Media Prize in Asia and the Pacific amateur category? 27) Who has been selected for 2016 Prof MV Pylee Award? 28) Anil Ganguly, who passed away recently, was related to which field? 29) Which of the following organisations is providing loan for implementation of Neeranchal National Watershed Project? 30) Mabh Bihu festival is celebrated in which of the following states? 31) Who has won the 2016 DSC Prize for South Asian Literature? 32) Who has been elected as the first female President of Taiwan? 33) The theater festival ‘Nandi Natakotsavam’ is celebrated in which state? 34) The Indira Gandhi Zoological Park (IGZP) is located in which state? 35) What is the India’s GDP growth forecast for 2016 as per the United Nations (UN)? 36) Who has won The Hindu Literary Prize 2015? 37) Who has been elected from India to the board of directors of the Asian Infrastructure Investment Bank (AIIB)? 38) The NITI Aayog has collaborated with which organisation for conducting a survey of manufacturing firms? 39) The Global Risks Report 2016 is published by which one of the following organisations? 40) The largest single-site solar power project in the world will come up in which Indian state? 41) What is India’s rank in the Global Talent Competitiveness Index (GTCI) 2015-16? 42) Which of the following European country has declared a state of economic emergency, recently? 43) Ajit Chandila is related to which sports? 44) Who is the author of the book titled “She Will Build Him A City”? 45) Aroon Tikekar, who passed away recently, was related to which field? 46) In which state, the 4th All India Police Archery Championship has started? 47) Burkina Faso, which is in news for terrorists attacks, is located in which part of the World? 48) What is the India’s economic growth forecast for current fiscal as per International Monetary Fund (IMF)? 49) The Lalitpur Super Thermal Power Project is located in which state? 50) Lakshman Rao Mohite, who passed away recently, hails from which state?